She’s of the girl variety and completely awesome even though she was up from 1am – 4:30am last night. 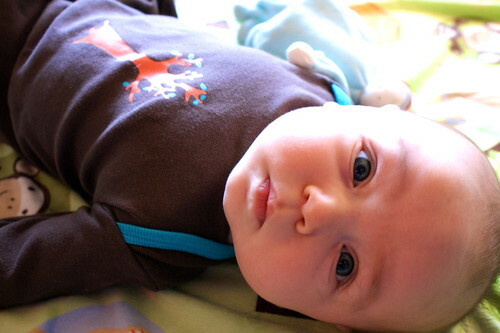 *sigh* Look at that face! Yes, you may have a pony…. I got Janet Hurst’s Homemade Cheese and in between naps and feeds, dug in. 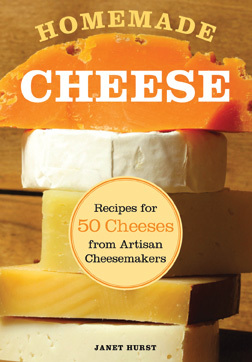 It’s a lovely book in full color with chapters about cheesemaking, the different components of cheese, interviews with cheesemakers and recipes with gorgeous photos of farms, animals, cheeses and dishes made with those cheeses — positively mouthwatering! I figured this was a good opportunity to get the women of FUCheese together and try one of the recipes. We chose halloumi. If you’ve had halloumi, you’ve probably had it fried — it excels at this! It won’t fully melt but gets warm and bubbly and lightly toasted on the outside. It’s perfect on its own or in a sandwich or on a salad. Major plus for this recipe is that it looked very easy: 1/2 gallon of milk, rennet and salt were all that was needed. Image from Pease Pudding who also has a halloumi recipe! A couple things stood out in this recipe — one, it required the milk to only come to a fairly low temperature, 86°. That took no time at all, excellent! Two, it required a lot of rennet — we made a double batch so added 1 tsp of rennet. I feel like most of our other recipes have required much less. Lastly, what really made this stand out were the instructions to return the drained curds to the whey for a second heating. Interesting! After the ladies went home, I ladled out the curd and set it to drain. It was really loose and just didn’t feel like it would knit at all. There was curd all the way to the bottom of the pot but it didn’t seem like it was going to come together and I couldn’t see any success in re-heating the curd in the leftover whey. So, I threw in the towel and dumped it. We’ve never done that! So, I have some thoughts on this recipe…. In consulting some other recipe sources I found one that suggested adding mesophilic starter and another that suggested adding yogurt with live cultures. This takes it out of the realm of the dead simple cheese but these additions may give it more firmness and stickiness — halloumi is meant to be a firmer cheese. Another consideration is my rennet. If I can find the time, I’m going to test it to see if it’s still doing what it’s supposed to be doing. I admit, it is pretty old. So, even though we did ultimately get curd, it wasn’t firm enough — maybe my rennet has lost its oomph. Another recipe I consulted dissolved the rennet in much less water — 1/2 tsp vs 1/4 cup. I really want to try to make this again as it looks like one of those fantastic recipes that gets you from milk to cheese in no time flat. 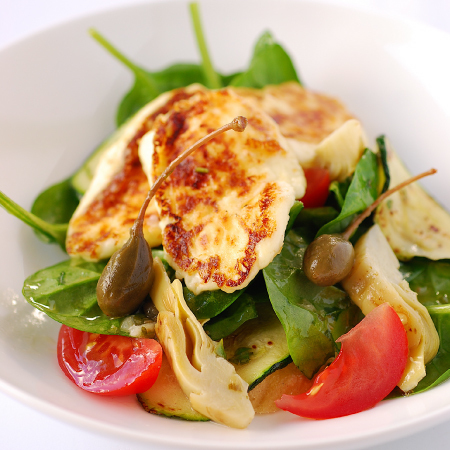 Plus, halloumi is delicious! So, we’ll make another go of this one for sure. And given all these variables, I’m not ready to write off the recipe yet. Hopefully we can revisit this sooner than a year from now. Anyway, do check out Hurst’s book — I think it is a really fantastic overview book that gives you a little taste of everything. I think it would be a great gift book for the cheese lover in your life as the information is really accessible and the photos are so delectable and inspiring. Plus, there’s a recipe for Devonshire Cream! available from Amazon, of course! Here is another cheese forum, I blend cheese and poetry to one. This summer I’m interning with THE cheese guy-Max McCalman.. I’m working at Artisanal Cheese Company. I went to Max’s Beer and Cheese class. It was great!